I am a big believer in the idea that the most significant design shifts tend to come from technological breakthroughs. The advance of laminate kitchen countertops — replacing linoleum and wood in most kitchens in the 1950s — came as a result of the very invention of plastic and then, the ability to manufacture it in long thin sheets with colorful designs laminated on to the top layer. Originally, countertop edges could not be bent or rolled, so that’s why we always see metal edging in early kitchens. 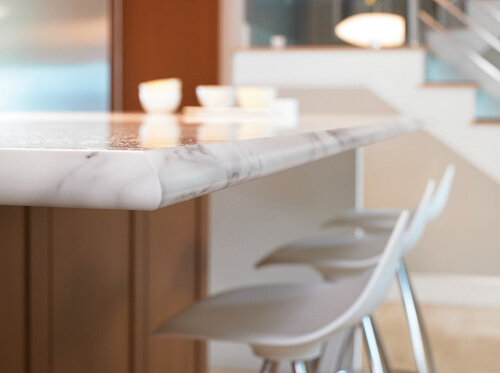 Later, around 1957, the countertop industry developed the ability — called thermoforming — to “roll” the edges and the backsplash in one continuous piece, eliminating the need for metal edging and introducing a big shift in the way kitchens looked. Homeowners who didn’t choose rolled edges chose flat edges, and metal edging faded from use. 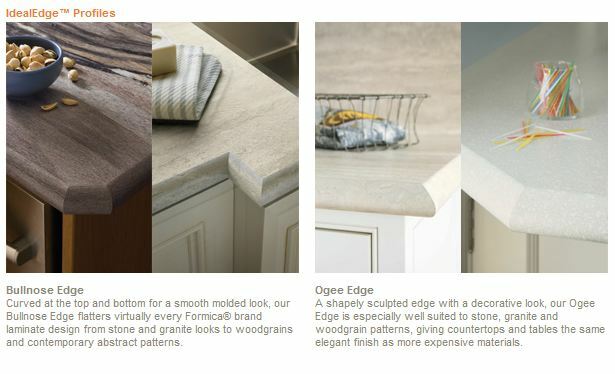 Now… 2012… we have another advance: Formica this week is introducing new laminate edging technology that allows us to have more intricate “ogee” or “bullnose” edging profiles on our Formica countertops — complete eliminating the tell-tale brown line that comes from a typical 90-degree edge. And, their new “Ideal Edge” — in these two curvy two designs — can go all the way around corners and ends, adapting to any cabinet or turn-the-corner configuration. Don’t want to take out a second mortgage (if you can get one, ha) to afford granite or marble countertops? Now, get the Ideal Edge… combine it with today’s laminates — which are remarkably realistic… and the bankrupt Joneses next door will have to look twice to see the difference. Note: Wilsonart’s “Cascade” edge, introduced in September, seems pretty similar to the Formica Ideal Edge/Bullnose and like the Formica technology, eliminates the brown line. So I’m not declaring Formica gets all the props for the innovation — they just did a good job catching my eye with this announcement, and with sending lots of great photos pronto. You know my general aesthetic when it comes to midcentury modern and midcentury modest houses: Granite isn’t *authentic*, and in unpretentious midcentury houses, it seems out of place (to me). But, I certainly like the idea off-white-and-gray Carrara (and if it’s not available, okay, Calacatta) marble — in particular in bathrooms, but also on a section of kitchen countertop, or on all of it, depending on how high falutin’ your house and your style is. 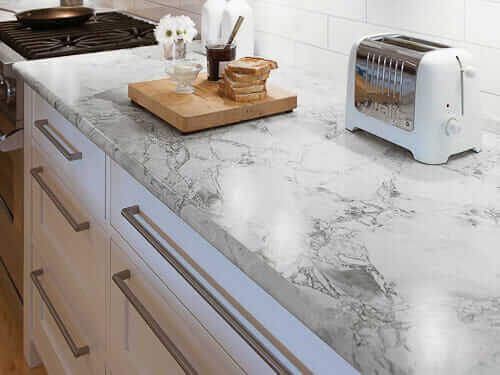 The beauty part of faux-marble laminate is that it is going to be (1) way easier to maintain than marble (2) way less expensive and (3) a more environmentally sensitive choice. 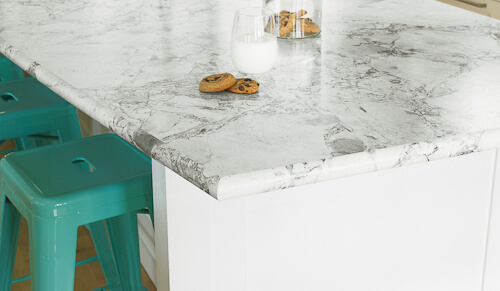 Carrara marble has been around forever in homes — it’s one of the few things that makes my “timeless design” list. Again: I particularly like the idea for bathrooms. The greyish-off white should go with virtually any pastel bathroom, which will likely also be chock-a-block with chrome and likely, gray grout in the floor tiles. Set in a Kohler hudee-rimmed sink, and you are ready to party like it’s 1959 or 1969 or 1979. Which laminates and edges do I like best? 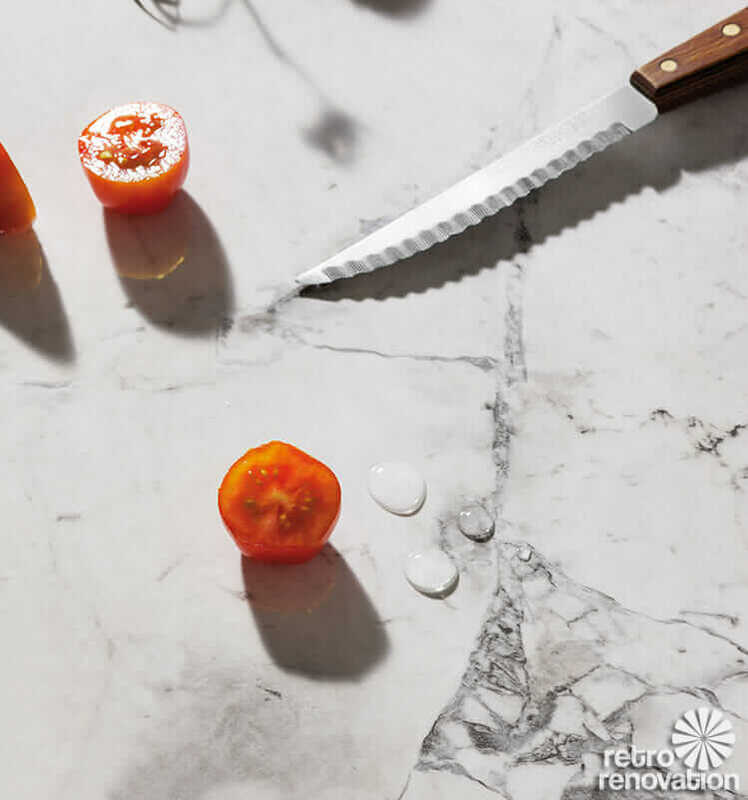 Note, the two Formica laminate designs shown in this story are not Carrara — they are Formica’s Calacatta, which is a larger veined marble, and Formica’s Bianca Luna, which seems to have heavier darker graining. For classic midcentury style, among these two, I’d go for Calacatta with the ogee edge — it’s less honkin’. 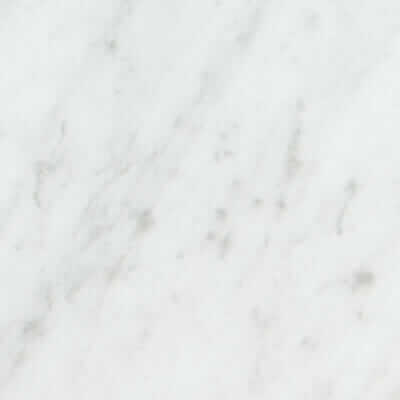 But, my favorite vintage-style-marble-laminate still is Carrara marble laminate — I recently found three companies with this style. 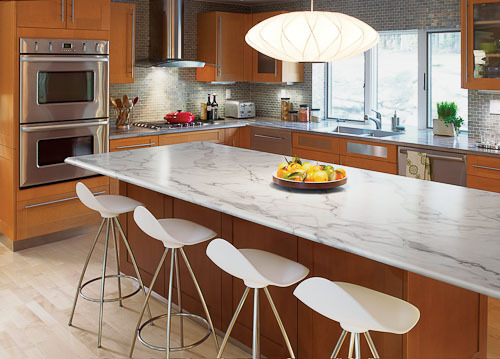 Yes, you can get Wilsonart’s “Carrara Santorini” laminate with the new, seamless bullnose edge. 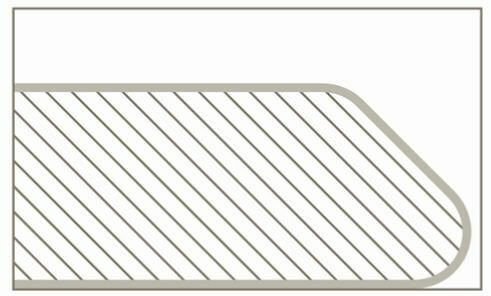 But, if you want the seamless ogee edge, you have to go with one of Formica’s choices. So… it’s a tradeoff. Get samples. Go see the edges. Agonize and torture DH. As usual. Formica Corporation, the inventor of high pressure laminate and the first to pioneer large-scale laminate design, introduces another breakthrough in laminate with IdealEdge™, decorative edges suitable for curved, clipped or 90-degree corner installations. Available in two versatile profiles – Ogee and Bullnose – IdealEdge™ transcends the customary limitations of laminate by eliminating flat edges and brown seams. Available in hundreds of Formica® Brand Laminate colors and patterns, IdealEdge™ profiles are produced in 12-foot lengths and are customizable to design specifications. Formica Corporation continues to lead the industry with innovative designs and green building solutions. Formica® Brand Laminate is available with FSC® (Forest Stewardship Council) certification and is GREENGUARD Indoor Air Quality Certified® by the GREENGUARD Environmental Institute under the GREENGUARD Standard for Low-Emitting Products, including the requirements for Children and Schools. In addition to IdealEdge™, Formica Corporation expands its 180fx® Collection with five new lighter, more neutral options. The patterns feature the premium finish Etchings™, a softly polished finish etched and dappled with highlights from tiny fissures reminiscent of those found in real granite and stone, or Radiance®, a high-gloss finish that is punctuated with texture and features holographic facets that refract and reflect light. Imitation stone? Imitation anything = tacky! At least the old stuff looked like what it was- plastic. I heartily disagree. Virtually all linoleum = imitation marble. Or imitation rugs. Or imitation something. Virtually all laminate = imitation something. Our entire housing and design world is full of imitation, for a variety of reasonable reasons. Tacky or not, there was a really powerful urge during the atomic age to make things look like other things — in particular, plastic look like a natural material. Formica is the Contact Paper of countertops and Vinyl Tile is the Formica of floors. I actually know a lot about plastics. It is EVERYWHERE. We could not have “modern life” without it. Pam, you know more about ALL of this stuff than the rest of us combined. I was just making a general observation about how these “fakes” were perceived back in the day. It seems to me that authenticity was not a watchword in the mid-century modern home. I think people were excited that they could get something that symbolized something like marble but was inexpensive and easy to take care of. I agree! Except about the I know more — many readers are Super Expert in various aspects — way more than me. That’s what makes this so fun and a journey of continuous discovery. This is timely for me and hubby — feeling very restless and discontented with our remuddled kitchen. Ultimately, it needs to be gutted to jack up sagging ceiling and see how studs and foundation are faring on damp side of house. This is far in the future. In the meantime, spending money on nice cosmetic changes is silly. Guess what we are thinking of doing to our backsplash– which is currently white-painted, dark “Brady Bunch” paneling? Fake tile decals! I have to say, they have come a long way with this stuff. We know it is fake — so will anyone who gets within 5 feet of it. But it looks very, very cool — and the company has done a custom color for free! A mosaic of jadeite green tones. Sometimes, fake is all you can afford. Chris, can you send me the link to the company that is doing this for you? Yes, “cheap and cheerful”… including “faux”… often equates to a life not shackled to debt. We got samples and they really look cool. They are emulating glass tiles, which are not period correct, but I think for our yucky little backsplash, it will be good. A nice backdrop for my pistachio colored stand mixer and some of my jadeite. The salesman who did the custom color for me is going to work up a price for the space. If it isn’t too, too much, I’m all over it! Oh — replying to myself to add more info…. The tiles are small. Again, not typical of the period at all. But I think this will be a good look, combined with the rest of my old authentic stuff. Hey Pam — I wonder — if they knew there was a niche out there for people who like the old stuff — maybe they would do some different styles! I remember those! 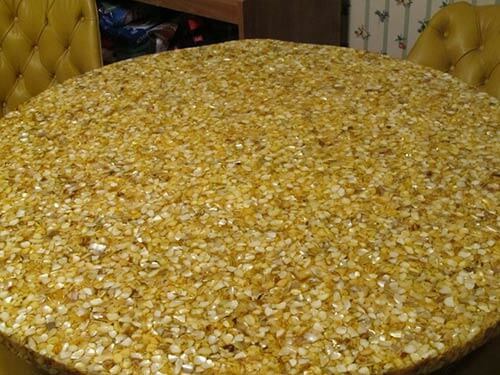 Very popular as back splashes in 1960’s kitchens in the upper midwest. Formica is very authentic from a mid-century perspective. I don’t think people were trying to make it something it isn’t – just a clean sanitary surface for a kitchen or bath regardless of the pattern. Not to mention being embraced by the corporate world. No one would mistake the laminated surface for the real thing – be it wood or stone. 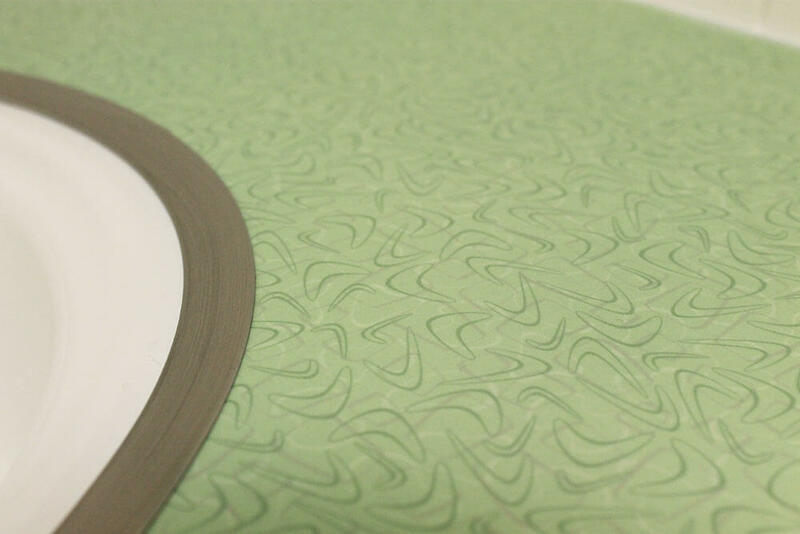 Formica is actually several layers of Paper, pressed together with heat, able to take over 300F and this new edging can be done with normal tools. I doubt anyone has equipment able to handle solid rock at their home. My son’s football helmet is actually made of formica and quite impervious to red wine and chili pepper sauce stains. No, that’s not true re linoleum. Old lino back to the 20s and before, had pretty patterns and didn’t look like marble or even rugs. Even William Morris designed a linoleum pattern (which I wish someone would reproduce). I don’t like fake things either. 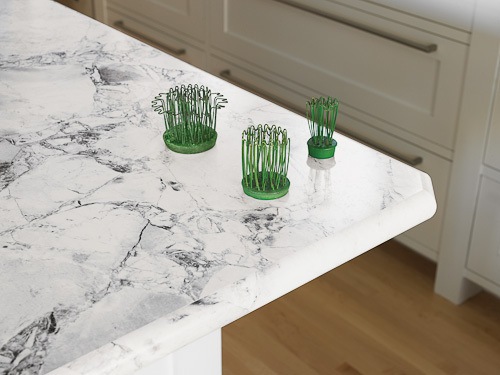 Things should look like what they are, and if you choose Formica, it should look like Formica, not fake marble. I will say the marble pattern is very convincing. My knowledge of linoleum history does not go that far back. I have a book, though, that I will have to dig out. I think this is a very interesting question. Will have to post about it soon and let everyone weigh in! As you can tell, at this moment at least, I am feeling very tolerant of the fake – at least when it comes to surface materials. Oh now this is very, very cool. What an innovation! If I was redoing my kitchen I would DEFINITELY be choosing this! I agree with Pam, it looks nice and won’t break the bank!!! I can think of an advantage to this edging style. Water can, and does, get under that brown edging line, and sooner or later, your laminate starts to come unglued. I have lived in enough mid century homes to know this, and only once was I lucky enough to have one with the darling metal edging (with vinyl inset that matched my laminate color). I remember having marble style laminate in the bathroom of our 1959 home when I was growing up, so nix the comments on marble laminate not being authentic. Yes-I’ve seen it that too. Water can get in and the edge falls off, the top loosens or bulges. Fake marble, I’ve seen it original in 50’s-60’s houses as well.